だれでもヨガに春が来た！ - spring has come to daredemo yoga! Spring has come to daredemo yoga! I love flowers in springtime. 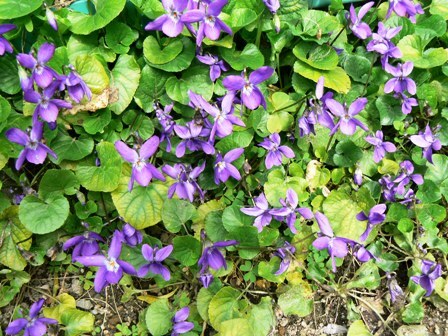 Little violets are carpeting a part of my garden – a splash of tiny bluish purple among vivid green. 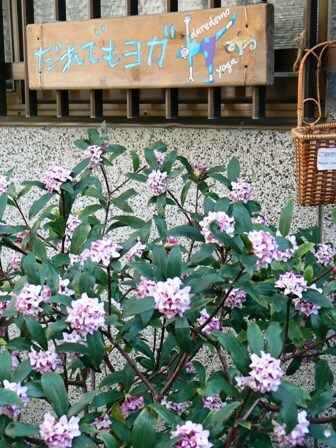 In the front garden, daphne is in bloom releasing heavenly scent. 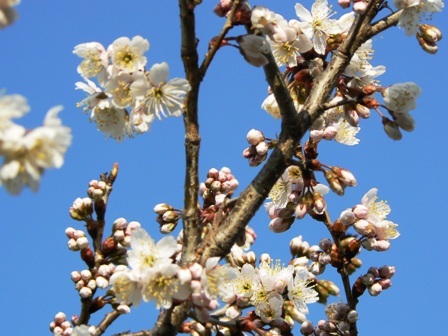 And the last but not least, a cherry tree in the back garden has started flowering already! This particular cherry tree always starts flowering early. Having said that, it is extra early this year – I guess this is due to warm weather spells we’ve had. When I see cherry blossoms, I truly feel spring has come! Tomorrow is a mystery and today? So another year is over and new one has begun. New Year is a time for new beginnings. I would like to share a wonderful quote with you. I found this while I was net surfing around the time I started teaching yoga. Don’t you find it inspiring? It is a human nature to drag on the past – it might be to do with the past mistakes, failures, lost opportunities or even the past glories. Also, many people fret over the future – what it may bring to them, success or hardships? Or simply worry about the aging process. We all know that what’s been done is done and we cannot change it. Of course, we can learn from the past mistakes, but beyond that, we should let the past go. And there’s no point in worrying about the unknown. We should embrace each day instead and enjoy whatever comes our way. Take each day as a gift. “Happiness resides not in possessions and not in gold; the feeling of happiness dwells in the soul.” – Another beautiful quote. The only person who could make you happy is you. 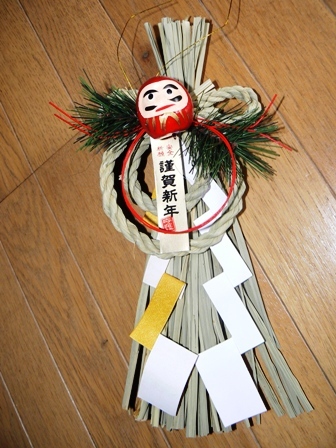 May your hopes and dreams for the New Year come true. Christmas is finally upon us! I just love Christmas, don’t you? Perhaps there is a part of me which has never really grown up. I feel peace, joy, and good-will all around me - there is definitely something magical about this time of the year. I love cooking Christmas dinner (not the traditional roast turkey, mind you, but vegetarian version!) 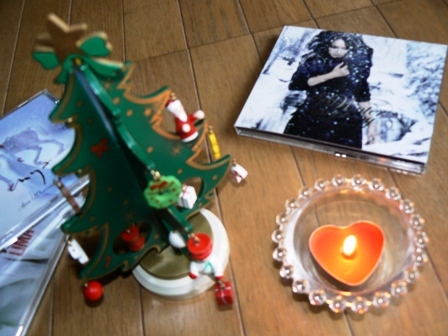 while listening to Christmas songs. I love unwrapping Christmas presents. And I love watching films on the telly with my darling Wolfie (little yorkie) curled up on my lap! There’s one film I watch year after year and never get bored with it. As you know, “A Christmas Carol” is a novel by Charles Dickens, one of the most popular English novelists of the Victorian era. It is a typical Victorian morality tale of redemption. The main character of the novel is Ebenezer Scrooge who is a miserly old skinflint. He hates everyone, especially children. But at one Christmas, three ghosts come to visit him to show him Christmas past, Christmas present and Christmas yet to come. These visits remind him of how his obsession with money lost him the love of his life and the happiness this cost him. They also make him realise the injustice and suffering of the world and the bleak future that awaits him unless he changes his ways. He mends his ways in time and gains a reputation as a kind and generous man who embodies the spirit of Christmas in his life. Many films have been made based on this novel. Anyhow, every year at least one of the terrestrial channels in <?xml:namespace prefix = st1 ns = "urn:schemas-microsoft-com:office:smarttags" />England shows one version of “A Christmas Carol” around Christmas time. And up to now, every year I ended up watching it. 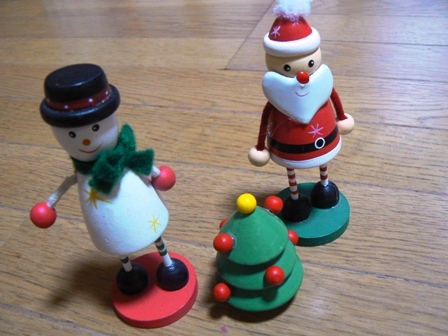 But, this year, I’m back in Japan feeling not Christmassy at all. Anyway, Happy Christmas to everyone! I just can’t believe it’s already December! We say time flies, but it’s so true. Everywhere in town centres are gearing up for Christmas and the festive decorations are just beautiful! I don’t have a TV at home, so I often listen to British radio programmes on the net. As Christmas is only a few weeks away, I hear loads of Christmas songs played on the radio. I just love Christmas songs! They fill me with warmth and happiness. So to bring out a seasonal spirit to everyone, I have chosen my best Christmas songs of all time! The results are very much biased, but here we go! Many artists have sung this song, but the King’s Rock’n’Roll version released in 1957 is the best! Its warm tune reminds me of family Christmas. Just lovely! It was released in 1973 and since then the song has been covered by many artists including Sarah Brightman. I like its upbeat tune and I still think that the original is the best. It was released in 1973 as well and famously beat Wizzard to No.1 spot in the singles chart. According to MSN Music poll done last year, the song was voted to the most loved Christmas song by the British public. This song was released in 1994 by Mariah Carey and it became a massive hit! Its tune is again upbeat and it has been covered by many artists. I like a version sung by Olivia Olson in a film “Love Actually” in 2003. The song was released in 1975. Sarah Brightman has covered the song among other artists and her beautiful voice matches well with the peaceful melody of the song. A famous charity song was released in 1984 to raise money and awareness to the devastating famine in Ethiopia. Many “In” artists of the era joined up for this song. In 2004, Band Aid 20 was formed including Chris Martin of Cold Play and re-released the song. And finally, the honourable first position goes to “Happy Christmas (War Is Over)” by John Lennon! John wrote this song to protest against Vietnam War and it was released in 1971. Since then, over 35 years has gone, but even now horrific wars and conflicts are going on somewhere in the world. I’m not a Christian nor into any particular religion. I do, however, believe in the Divinity and goodness in every human-being. After spending many years in London, for me Christmas is a time to spend with loved ones as well as a time for forgiveness and acceptance. Yoga appears to increase feelings of compassion and interconnections. If all the people in the world took up Yoga, wars and conflicts would cease and “world peace” might reign. May all beings of the world be happy and prosperous! like a homebaked cookie and a cup of tea. the leaves crunching underfoot, and big puffy clouds way up in the sky. When was the last time I spent autumn in <?xml:namespace prefix = st1 ns = "urn:schemas-microsoft-com:office:smarttags" />Japan? In England, we don’t normally have a time to enjoy autumn as winter comes so suddenly. There are many open spaces full of greeneries there, but when we noticed all the leaves have already gone, and naked trees seem to be shivering in the chilly wind. Needless to say, I haven’t enjoyed the colours of autumn for many years. As I was away from Japan for so long, I appreciate its beauty more and realise how wonderful it is to enjoy each season’s spectacular show. Since I returned to Japan this summer, I have been very much looking forward to seeing the colours of autumn. I had an opportunity to enjoy them, finally! Our destination was Shiga Prefecture. We visited Enryaku-ji (temple) in Mount Hiei, Hira, and Ishiyama-dera (temple) which is famous for its association with Murasaki Shikibu. They did not disappoint me. 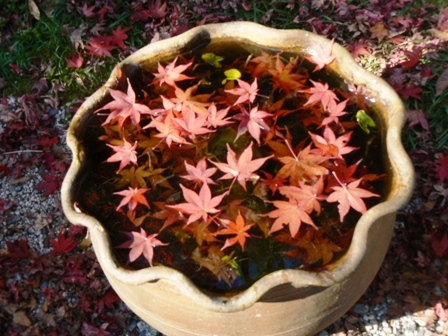 Japanese Maple Tree or “Momiji” we call it in Japan, was absolutely beautiful especially in Ishiyama-dera. 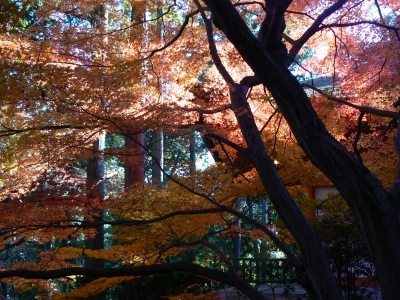 We were very lucky with weather, too, and the contrast between blue, blue sky, evergreen trees and the yellows and reds of “Momiji” was beyond any words to describe. Seeing such beautiful scenery filled me with imagination and it made me quite poetic. I almost picked up a pen and wrote a poem to praise the season’s grandeur! My imagination, however, quickly came to its limitation before I could put down a few words. It is a pity, though! This poet resides in Boston, USA. By reading this poem, an image of a crispy autumn air and a walk in a wood full of red, yellow and golden trees arises, doesn’t it? I so wish to visit New England in autumn one day. Its colours would be just as glorious as the one I have witnessed here, I’m sure.